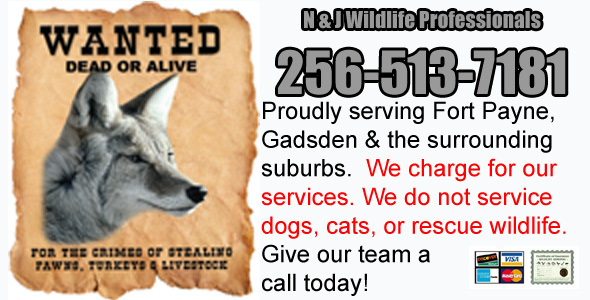 N & J Wildlife Professionals is a full-service wildlife control company serving Fort Payne AL and the surrounding area. We specialize in urban and suburban wildlife damage management for both residential and commercial customers. We are state licensed by the Alabama Fish & Wildlife Commission. We handle nearly all aspects of wildlife control, and resolve conflicts between people and wildlife in a humane and professional manner. For Fort Payne pest control of wildlife, just give us a call at 256-513-7181 - yes, we answer our phones 24 hours a day, 7 days a week - and we will discuss your wildlife problem and schedule an appointment to solve it. We look forward to hearing from you! Many of Alabama's wild animals have learned to adapt and even thrive in our homes. For example some wildlife have found that attics make great places to live. Other animals find refuge under homes or porches. Invariably, these animals cause damage. Rodents, like squirrels and rats, love to chew on electrical wires once in an attic, and this causes a serious fire hazard. Raccoons can cause serious contamination in an attic with their droppings and parasites. Same goes for bat or bird colonies. We specialize in solving Alabama's wildlife problems, from snake removal to large jobs like commercial bat control, we do it all. We do not handle dog or cat problems. If you need assistance with a domestic animal, such as a dog or a cat, you need to call your local DeKalb county animal services for assistance. They can help you out with issues such as stray dogs, stray cats, spay & neuter programs, vaccinations, licenses, pet adoption, bite reports, deceased pets, lost pets, local animal complaints and to report neglected or abused animals. There is no free Fort Payne animal control for wildlife issues. Armadillos are classified as pest animals and one of their main habits is digging. They dig through all over the yard creating small holes and large burrows. They can also build large tunnel right next to or under your house. This can cause a lot of problems for you. No one wants their yard to be dug and look ugly. Armadillos usually find food by digging into the surface. Their usual food could be earthworms. So if you find holes in your garden or yard then it is usually the sign that Armadillo is present there. You can get rid of armadillo�s by trapping them. Here�s a list of different types of traps and bait that can be used to catch Armadillo. You do not require a specific kind of trap to catch Armadillo. So a live cage trap which is racoon sized can perfectly do the job. The dimensions of the trap should be atleast 30 inches long, 12 inches high and 10 inches wide. Still if you are having some doubts regarding this then you can go for a Havahart 1079 trap. It is also important that you choose a trap which is quite sturdy as Armadillos have large claws and they can break any trap which isn�t solid. If you are looking for lethal traps to kill the Armadillo, then there isn�t one. The reason behind it is that Armadillo has armour which makes it difficult to trap them and kill. Speaking in strict sense, there is no specific bait to trap Armadillos. The reason behind it is that they eat food that is dug out of ground. They won�t eat any food that is present on the surface itself or as matter of fact, in the cage too. So the most important feature required to trap the Armadillo is the location of the trap. So now we know that to trap the Armadillo, location is the point. So let�s start with it. Since Armadillos have poor eyesight, they travel only on certain pathways. They dig burrows here and there and most of the burrows are usually escape burrows. They are just few feet below the ground. For sleeping they usually have just one burrow. So if you find that main burrow then that is the best location for the trap. But you can also set up the trap on the pathway to small burrows too and that will do the work. Fort Payne Animal News Clip: No current news article at this time.